The VJK indicators consist of a red/white disc, mounted on an axle in a housing. On top of the housing, just above the disc, there is a transparent plastic lens that makes the disc appear clearly. When the indicator is exposed for an AC magnetic field that is strong enough, the disc can not remain motionless, and it starts to rotate in either direction. The rotation of the disc indicates an AC magnetic field in the point where the indicator is placed or held. 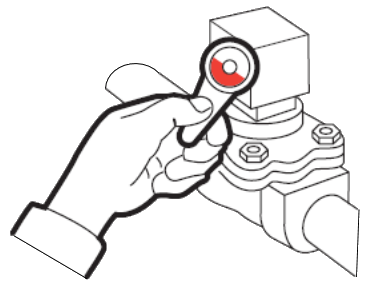 Apart from just indicating an AC magnetic field, the VJK indicators also can be used as rotation testers for certain circulation pumps. The two basic functions mentioned are described in the instruction slip that is delivered with a Key-ring indicator (referring to the tab “VJK Indicators”). See instruction below. The well-known VJK Key-Ring Indicator is shown on the top left photo. This product is a unique instrument and at the same time, a highly appreciated “give away”, supplied with the client logotype. In order to prepare the client logotype prints, we need a logotype original, preferably sent to us by Email, e.g. in a jpg format. We also need detailed information regarding the colors included, e.g. "Pantone Color Code Numbers". Below the Key-Ring indicator (to the right), two indicators for permanent installations are shown. They are mounted on solenoid valves, transformers etc, usually by use of self-adhesive washers. The indicator indicates magnetic fields from a.c. sources, e.g. solenoids valves, transformers etc. Place the indicator close to the a.c. device. The red-white disc will rotate when the device is active. The tester indicates magnetic fields and rotation direction for certain circulation pumps. Place the indicator at the motor center. 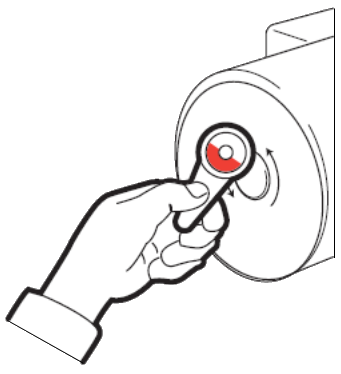 The red-white disc rotates in the same direction as the pump when the motor is running.